Out of the six species of deer found in the UK, the three that we deal with on a regular basis are roe, fallow and muntjac. The main reasons for them being admitted to Vale are either road traffic accidents or fence casualties. Adult deer do not do well in captivity as they often suffer from what is known as ‘capture (or stress) myopathy’, a condition brought on by stress as the name suggests, which causes irreversible muscle breakdown and leads to death after a period of time. DEER IN THE ROAD – If you come across a deer in the road that has been hit by a car, call your nearest wildlife rescue centre immediately and if possible, stay with the deer until help arrives (in case it manages to move away, in which case, try to keep an eye on where it goes). If it is in the middle of the road, causing a risk of an accident, try to make other road users aware of the danger by using your hazard warning lights and warning triangles (if you have them). You may need to inform the Police if it is causing a risk to other road users. If you attempt to move it out of the road, please be very careful as deer have very powerful legs and they will kick out in panic, particularly with the hind legs. Their hooves can inflict serious injuries. If you have a coat or something similar, carefully cover the deer with it. 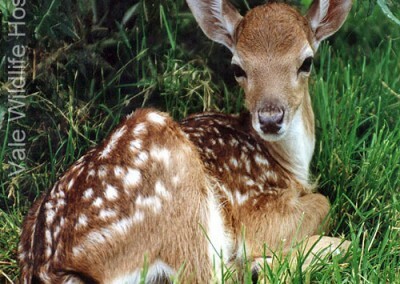 FAWNS – If you come across a fawn which appears to have been abandoned, DO NOT APPROACH OR TOUCH IT. 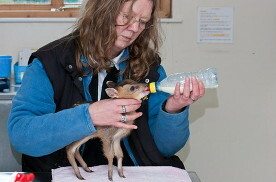 Seek advice from your nearest wildlife rescue centre. 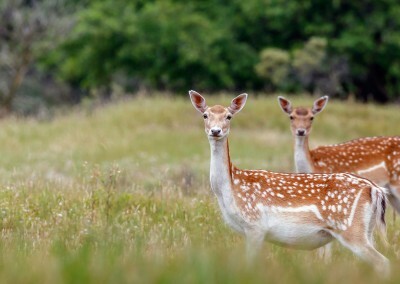 Very few lone fawns actually need help. 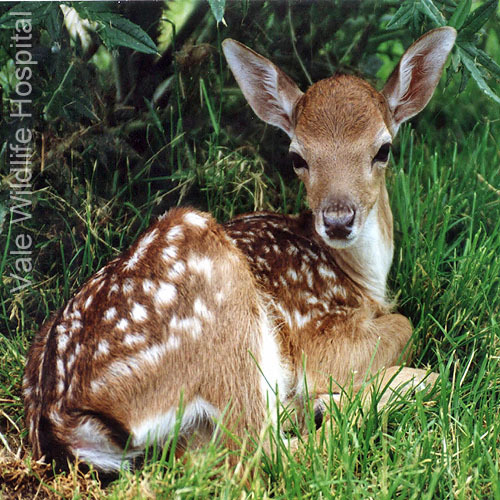 It is perfectly normal for a fawn to be left in a sheltered place or in long grass while mum goes off to forage for food, often for many hours. The advice we usually give is to leave the fawn alone and return in a few hours to see if it is still there. Often however, mum will not return until dusk or later and she certainly will not return if you are close by. Of course, if the fawn is obviously sick or injured, or it is in an unusual place e.g. in the road or out in the open, then it will need to be rescued but please get advice from experienced people before intervening. FENCES – Deer often get caught in fences while trying to jump them. Usually caught by a hind leg, often causing major injuries, your local wildlife rescue centre must be contacted immediately. NEVER be tempted to free the deer and release it. Not only could you risk injury to yourself from the hooves of the deer, but a constriction injury often leads to what is called ‘pressure necrosis’. Even if it looks totally uninjured, the line where the wire or snare has been will often start to break down after a few days resulting in serious damage to the area and underlying tissue. If this happens after the deer has been released the injury is likely to become seriously infected, leading to septicaemia and possibly death. Any animal which has suffered any sort of constriction injury must be kept for a minimum of 7 days before release in order to monitor the constriction site. 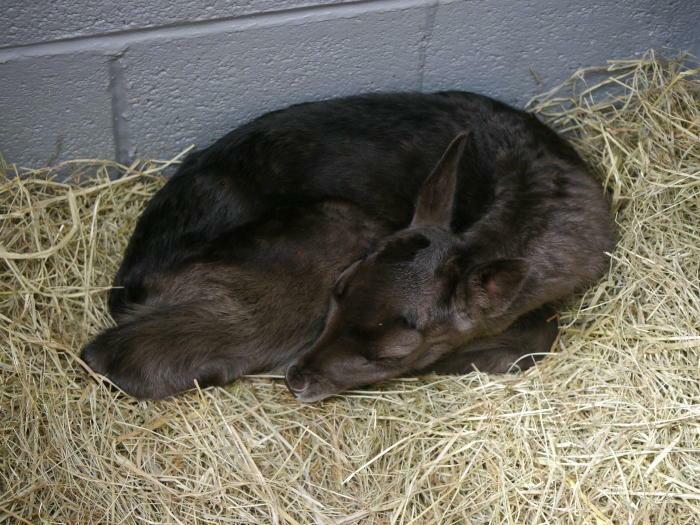 CONTACT US ON 01386 882288 FOR ADVICE ON WHAT TO DO IF YOU FIND A SICK, INJURED OR ORPHANED DEER. DO NOT ATTEMPT TO HANDLE OR TOUCH IT.